MEMPHIS, Tenn. (AP) The Memphis Grizzlies haven’t won many games lately, and those few victories have featured drama in the closing seconds. Austin Rivers had 38 points, his second straight game setting a career high, while Williams finished with 36. But no other Clippers player reached double figures. 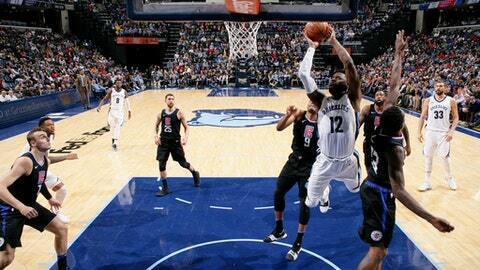 DeAndre Jordan, the league’s leading rebounder, had 18 boards. ”It was a great comeback at the end when you’re down that many,” Clippers coach Doc Rivers said. For the Clippers, playing the second night of a back-to-back after a win in Houston on Friday, there wasn’t quite enough energy to overcome the deficit. Clippers: Los Angeles fell to 6-12 on the road. … The Clippers, as they have been in recent games, were without F Blake Griffin, G Patrick Beverley, F Danilo Gallinari and F Wesley Johnson. That represents an average of 56.1 points per game on the injured list. … Jordan reached double figures in rebounds for the 20th time this season. Grizzlies: The 63 first-half points were two short of Memphis’ season high for a half. … Evans has scored at least 20 points in 15 games this season, and his six 3-pointers were a career-high. … Gasol’s 15 rebounds were one short of his career-best 16 against the Pelicans on Jan. 16, 2015. … Memphis had 28 assists on its 40 made field goals. … The 115 points were a season high for Memphis. The Clippers won an emotional game in Houston on Friday, expending a lot of energy while scoring 76 points in the second half to erase a 15-points Rockets lead. Doc Rivers was concerned about the impact of Friday’s game even before playing the Grizzlies. And the fatigue was a factor.